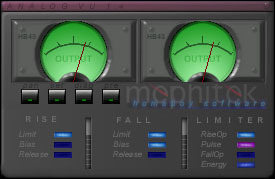 Analog VU s an analog VU meter simulation for Winamp 2.x. It simulates the sweeping rise and fall action of a classic Analog VU meter. Its response is fully customizable, using the sliders in the 'SET' panel, and customized setting combinations can be stored using the 'PRE' panel. This is great! i don't have WinAmp, but i got it work on Jet Audio by adding the DLL file. Lots of different analog displays!!! great! Very cool and realistic looking plugin.